“HACU is pleased to see the funding allocation for the Student Centered Funding Formula.” The SCFF, implemented in 2018, provides additional funds for supporting Pell Grant recipients, California College Promise Grant recipients, and AB 540 students. The Budget reflects ongoing support for undocumented students at University of California, California State University, and California Community College. This funding is crucial to continue the advancement of Latino higher education. HACU, founded in 1986, represents more than 500 colleges and universities in the United States, Puerto Rico, Latin America, Spain and school districts throughout the U.S. The mission of HACU is to Champion Hispanic Success in Higher Education. 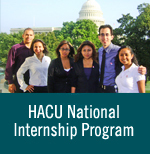 HACU is the only national association representing existing and emerging Hispanic-Serving Institutions (HSIs). The Association’s headquarters are located in San Antonio, Texas, with regional offices in Washington D.C., and Sacramento, California. Information is available at www.hacu.net.